‘He’s definitely not looking for a girlfriend,’ an insider says. Stars spotted in everything from boho chic to barely there! PIC: Jared Leto Now Has Platinum Blonde Hair, Too! Jared Leto Chops His Hair Off For New Movie Role! 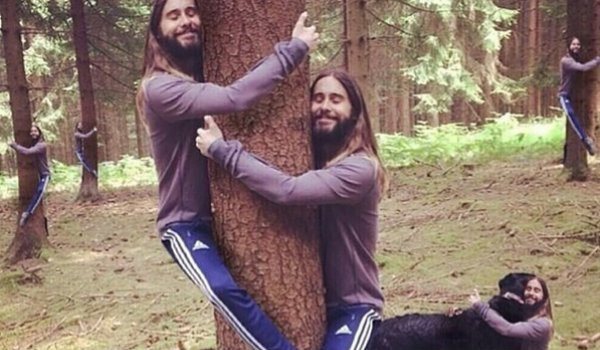 Jared Leto turns 43 today, but he can still hang out with the cool youngesters on Instagram. The Oscar-winning star has over two million followers and started a great photo shop meme with one of his Instagram pics. Celebrate his b-day by enjoying his best Instagram moments. WATCH: Jimmy Fallon Trims Jared Leto's Beard! Some of the biggest names in music came out on Thursday night for the iHeartRadio Music Awards, and there was no shortage of talked-about looks! Click through the gallery below to check out all the fashion and beauty– from Rihanna’s Orange is the New Black, “Crazy Eyes”-inspired hairstyle, to Selena Gomez’s midriff-baring ensemble — and more! Jared Leto vs. Lupita Nyong'o: Best Oscars Photobomb?! Funny Video: Celebs Read More Mean Tweets!